Both in terms of tone for what is meant to be a show about high school kids in the Doctor Who universe, but also because... you know. Lighting stuff. Symbolism! The BBC has revealed the first picture from Class, Patrick Ness’ new young-adult Who spinoff set in Coal Hill School, former place of work (and study) of companions Clara, Susan, Barbara, and Ian. But instead of textbooks and chalkboards, you’ve got two characters stalking the school corridors at night, and one of them is packing a rather alien-looking pistol. 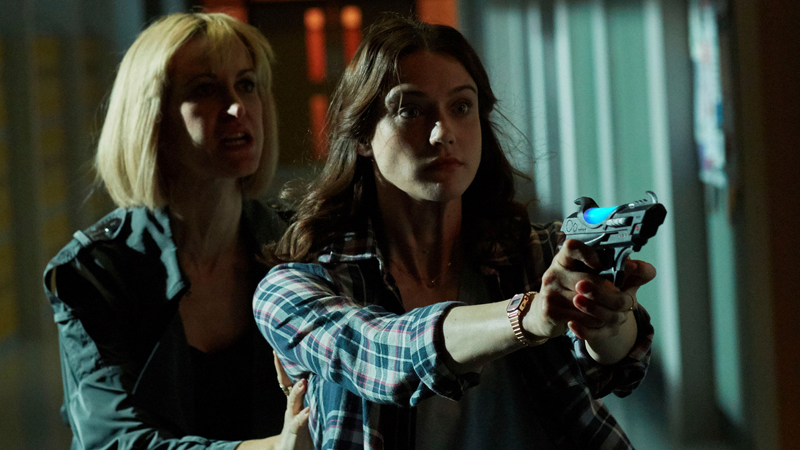 The image also comes with the first confirmed character names for the series—up top is Miss Quill, played by Katherine Kelly, a teacher described in the original cast announcement as a “powerful new presence at Coal Hill School,” and the alien gun owner is April, played by Sophie Hopkins. Presumably said gun is being pointed at your standard Doctor Who monster/alien threat. We did just recently hear that Class is taking a leaf out of former spinoff Torchwood’s book for its premise, just without the mature content. But apparently this may mean, judging by this first look, it’s going to be a little darker than many people might have expected. Class begins on BBC One and BBC America next month.